Justice Antonin Scalia died Saturday, February 13, 2016. The cause of death was a heart attack. I admit, I never followed Justice Antonin Scalia’s moves closely because I felt I knew where he was going. My take — he was appointed by President Ronald Reagan to forward the Conservative agenda from the US Supreme Court. I never bothered to re-post Scalia’s quotes on affirmative action cases, as many did. There were no surprises there either. The move I am following is the impact of the Justice’s untimely death Saturday at a hunting ranch in Texas. 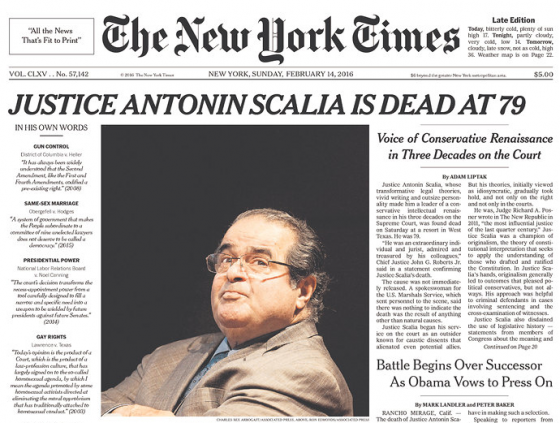 A figure that seemed larger than life on the US Supreme Court is dead. Yet another surprise death of a celebrity-type figure in 2016 and it isn’t even March. Justice Scalia was a good man; a wonderful husband who loved his wife and his family; a man of strong faith; a towering intellect; a legal giant; and a dear, dear friend. In every case, he gave it his all to get the broad principles and the small details right. Virginia and I are deeply saddened by his sudden and untimely death. Our prayers and love go out to Maureen and the Scalia family. It is hard to imagine the Court without my friend. I will miss him beyond all measure. In addition to removing the intellectual and Constitutional “head” of the Conservative agenda on the Supreme Court, Scalia’s absence takes a personality even a character (as we say for strong personality types) from the main stage. He was bold enough to be one. Was that arrogance, a sense of entitlement? Scalia even had a culture. Proud Italian American, Catholic, opera lover, sportsman (hunter). Someone who never backed down from a rhetorical fight. What’s there to lose when you have a job for life? Only your legacy is at stake. He seemed at ease with his. Republican Senate Majority leader Mitch McConnell decided to risk legacy and decorum by politicizing the moment before the body was even cold. McConnell would do better to step back and say he was speaking in a moment of grief vs solidifying the Republican party’s character as fractured and dysfunctional. Afterall, the Supreme Court may not be in as much turmoil on key issues as the Republican Party at this time. NPR Supreme Court correspondent Nina Totenberg says as much. Affirmative action has been argued. But abortion, immigration, a big religion case, some important environmental cases, they haven’t been argued. Those cases will not be decided with a five to four vote, because there is not a fifth reliable conservative vote. There are four reliable liberal votes, three reliable conservative votes, and one conservative swing vote in Justice Kennedy. What is going to happen to those? God only knows. As I write I realize I never saw past the character Scalia played as the Conservative Supreme Court Justice with the biting wit. This may be the time to look through the justice’s Supreme Court records if I have the time or a curiosity to satisfy. I’m sure there are surprises there for everyone. Scalia’s close friendship with Justice Ruth Bader Ginsburg is one of those slice of life anomalies for some people. After all opera lovers have to stick together. Maybe their relationship will be the story of HBO’s next Supreme Court drama. Senator Mitchell has made SCOTUS THE TOPIC for the 2016 election. Interpreting the Constitution and appointing judges don’t bring in the debate ratings — but the subjects can’t be avoided now. As the cameras point in the SCOTUS’s direction, Donald Trump may be compelled to visit the National Archives gift shop before the autumn leaves begin to fall.